Aren’t trampolines fun enough already? Yes, they absolutely are, but every parent knows that kids seem to have an endless amount of energy at any given time of the day. Getting them to use this excess energy in a fun and productive way is, well, impossible sometimes. More and more it seems as though today’s children with would rather sit in front of a TV or a computer, something the rest of us have to drink coffee just to accomplish. So, how can you get your child outside and active during their summer break? All it takes is something as simple as a trampoline basketball hoop and a little imagination. This list highlights some of the best games anyone can play on a trampoline. Each is guaranteed to get your children off of the couch and playing outside while giving them hours of fun. Starting off with something that toddlers can enjoy, we have Ring Around the Rosy. This classic is played the same way it would be on the ground, but the falling down part is ten times more fun. 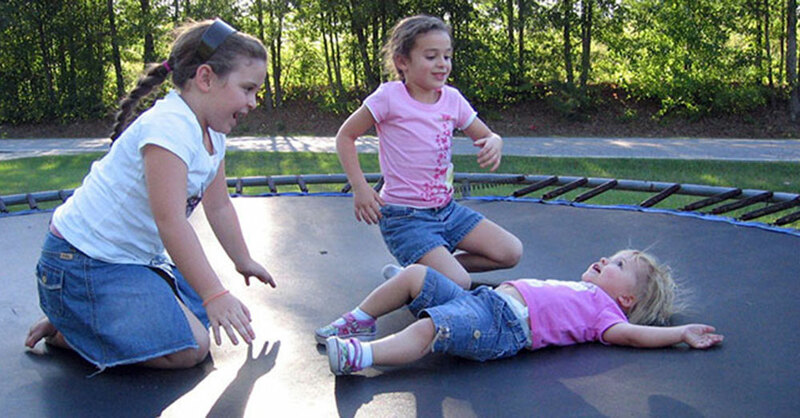 These games can be played on smaller trampolines for children, or on full-size backyard models. To add an extra level of excitement into the mix, encourage your children to use their imaginations as to how they group should fall down. Each can take a turn saying something like “we all fall down silly” or “we all fall down backward” to keep the game entertaining. This one is best suited for a larger trampoline, but smaller round models can make for one intense game. This version of dodgeball requires two people to stand inside of the netting while the rest of the players circle the outside of the net. Players score points by tagging someone on the trampoline with the ball, which allows them to take that person’s place. Always make sure to keep a net on for safety, it also adds an incredible challenge to this game. Alternatively, players can score by how many rounds they can stay on the trampoline without being tagged. All you need for that play style is a timer and to determine how long each round will be. This one will require at least four players, and everyone must jump in one place continuously. If you stop jumping, you lose. A softball, or anything else that you might want to use, takes the place of the “potato” as the players toss it around between one another. What makes this game so challenging, and therefore so addictive, is having to jump around continually. It’s a lot harder than you might think to catch the ball without dropping it. Pro parenting tip: this is a birthday party smash hit! Believe it or not, you can turn your trampoline into an exciting basketball court with a few simple steps. You can choose to use an actual hoop by placing it up against the net or use one of the various models made to attach to your trampoline. A trampoline basketball hoop allows your child to become a Harlem Globetrotter in their backyard. This is one of the simplest games but also one of the most fun out there, and perfect for a single player. This one has also gone by many names, like telephone, so feel free to let your children come up with a unique name to get them more interested in playing. All players wait around the trampoline and take turns by moving around the circle. Whoever’s turn it goes onto the mat and does a trick, like a backdrop, then exits back to the ring. The next player must perform the same trick and add in another one. The third player performs both tricks and adds on another, with this cycle continuing until someone forgets the full sequence of tricks. After forgetting, the player is out and gets to “judge” by making sure the sequence is followed correctly. This one can get a little tricky, so make sure to join is as a judge to help things progress smoothly. This one is so much fun that you might find yourself wanting to join in on the action! Okay, this one isn’t exactly a game but who doesn’t love playing in a sprinkler? Perfect for scorching summer days, this is guaranteed to be something your kids will remember as they grow older. All you have to do is set up a sprinkler to spray on the trampoline and let the fun begin. Summer nights are the best, and just because the stars are out doesn’t mean your little ones have to stop enjoying their trampoline. Grab a lantern or a flashlight and sit your family around the mat, snacks included, then take turns telling made up stories to one another. You’ll be surprised at how vivid and exciting their imaginations can be when you let them run wild, and they’ll have enough fun to tire them out before bedtime. It’s a win-win situation. There are multiple variations of this game, but this one will focus on using a net for safety. Players are divided into two teams, the attackers, and defenders. Defenders will be inside of the trampoline while the attackers wait outside with plenty of soft projectiles to toss inside, balls work best. The goal of the attackers is to get every last ball inside of the trampoline, while the defenders must try to get every last ball outside. This could go on for hours, so make sure to set a timer and call a cease-fire once time runs out. Count up the points by how many balls are inside and outside of the net. Whichever side has the most points wins that round and the fun can start all over again. To keep things interesting, give both teams a chance to attack and defend. If you’re feeling adventurous, hop in yourself and be the attacking giant or defending king’s guard. This one is my personal favorite. One person sits down in the middle of the trampoline, puts their knees to their chest and wraps their arms around them. They are the 'egg'. The remaining players then bounce the egg, trying to 'crack' the egg - or getting the egg to let go of their legs. Be sure that all the players around the egg stay on the outside. Best played on a trampoline with a net. If you have any other games you love to play, leave them in the comments below!